The Saugatuck Rowing Club continues to pump out national caliber athletes. And a good number of them live right here in Westport. Eddie Kiev was a coxswain on the US Under-17 junior national team. 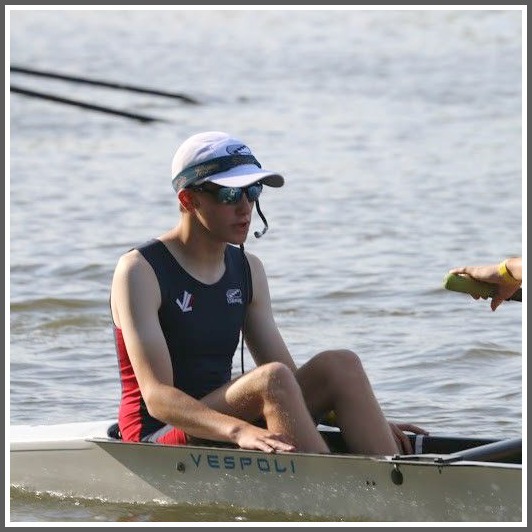 He helped his boat to a silver medal on Friday, at the US Rowing Club National Championships in Camden, New Jersey. Eddie Kiev, national team coxswain. Parker Cuthbertson was a member of the CanAmMex junior national team that won a gold medal last week in Mexico City. Sven Herrman and Sam Kleiner were part of the men’s high-performance team, which also competed in Camden. Sam won a bronze in the U-19 4+ event. And keep your eyes on these guys (and gals): Harry Burke will row for the men’s U-19 worlds team, and Kelsey McGinley, Alin Pasa and Noelle Amlicke are on the women’s U-19 worlds team. Both boats compete in the Czech Republic on August 8. All are Staples High School students. And all of “06880” congratulates them for their great work! This entry was posted in People, Sports, Staples HS and tagged Ssaugatuck Rowing Club. Bookmark the permalink. 06880 never fails to weave the fibers of this community together. Many thanks for all the here and now and past articles that you send out Dan. and the hours they devote to their pursuit of perfection on the water. Thanks Julie. You captured the way so many of us feel about Dan, his Blog and Westport. Not only did you capture it you wrote with eloquence. Saugatuck rowing club boats also make waves (wakes) on the saugatuck river in a no wake zone, some times knocking people off docks, some times scuffing up boats tied to docks, and sometimes just being completely discourteous and blocking boats trying to navigate the channel.